Get to know our Jerseys, sheep, horses, and oxen through interactive programs and activities. Explore the barns and calf nursery and watch the afternoon milking of the herd. Visitors will experience a first-hand sampling of actual farm work, animals, and agricultural processes. The authentically restored 1890 Farm House, the center of the farm and forestry operation a century ago – features the farm manager’s office, family living quarters – and creamery, where butter was produced for market. Interactive programs in the farmhouse for visitors and students interpret 19th century agricultural improvement, butter production, and domestic life. Engaging exhibits housed in 19th century barns depict the annual cycle of rural life and work, as well as the cultural values of Vermont farm families a century ago. 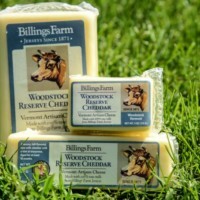 Recently added to the cheese cooler, Woodstock Reserve Cheddar is aged a minimum of 15 months and boasts a savory, full-flavor with a hint of sharpness. 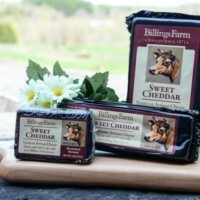 This is the perfect cheddar for casual eating and making an impression at any dinner party. Sweet Cheddar boasts a sweet, full-cream flavor. This particular variety is especially popular for its firm, yet creamy texture, with a pleasant, savory taste at room temperature and is equally good on the cheese tray and for cooking. 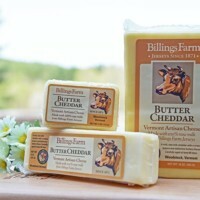 Butter Cheddar, also known as Butterkäse, is mild and creamy with a slightly salty or acidic taste reminiscent of Muenster or Gouda cheeses. Known for its delicate flavor, it literally melts in your mouth at room temperature. Also great for for cooking!